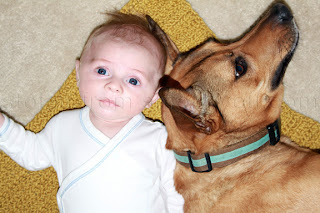 My dog could care less about the baby, but...Milo and Kalli look so cute together! Well you know I love that story--a boy and his dog. When do I get a copy of that picture, my dear brother. So it's "a boy and his dog" all over again, but this time the boy is Miloh and not Kenny. :-) Love you all! Love this! Piper and Gilbert are also bff and it is so cute. Now that she's walking and talking a bit it's even cuter. She gets up in the morning and when we come out of her room I ask her where her puppy is and she takes off for his crate so they can start tearing up my house together. AND she learned how to open it and let him out. She waves hi and bye to him too. Meltingly adorable. Great post. Can't wait to introduce the Girls (as we call the dogs) to Baby Grrl!™ (as we call our D-minus 2 months daughter).